BELGIAN DESIGNER ALAIN GILLES, who chairs the judging panel at the 2016 Silmo D’Or awards, has forged an unusual career path. After studying Political Science and Marketing Management, he spent five relatively unfulfilling years working in the financial sector at JP Morgan before deciding to change course and follow his passion for industrial design, aesthetics and creativity. to me, I work on the curves or add a material that evokes a more feminine feel.” " In-Focus No. 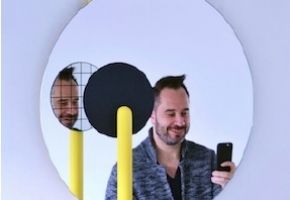 2"
This year, he has created an art piece for the Fonds Erasme — Mirror Mirror — which will be sold at auction to fund medical research. “The concept behind it is based on a perception and analysis of our society. The idea of studying and investigating oneself, in an endless search for the self, is an aspect present in modern society which has become clouded by appearances and the image we reflect back on ourselves through, for example, new technologies and social media networks including Facebook and Instagram. ” A powerful nod to the optics and eyewear sector, which is certain to appreciate the generous perspective of a major designer.